Sign In to view your personalized passport or register to begin providing proof of course completions. 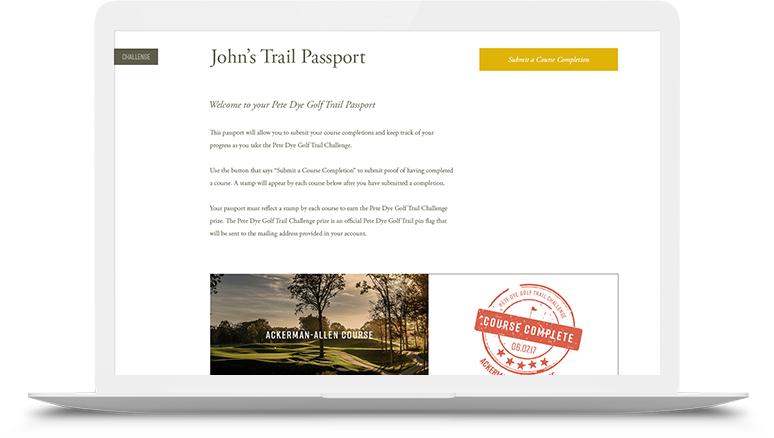 This passport will allow you to submit your course completions and keep track of your progress as you take the Pete Dye Golf Trail Challenge. Use the button that says “Submit a Course Completion” to submit proof of having completed a course. A stamp will appear by each course after you have submitted a completion. Your passport must reflect a stamp by each course to earn the Pete Dye Golf Trail Challenge prize. The prize is an official Pete Dye Golf Trail pin flag that will be sent to the mailing address provided in your account.